It’s that time of year again—when many of us resolve to do better and be better. 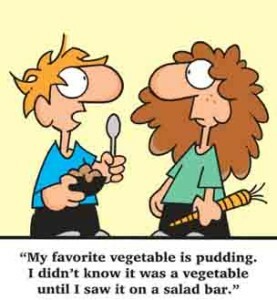 Weight loss is high on the list of most people’s priorities. According to 2014 studies, more than two-thirds of U.S. adults are currently overweight or obese. Obesity is correlated with many serious disease conditions and earlier mortality, so the message is clear: Excess weight does not make for good health. Still, losing weight is a more difficult proposition than just recognizing the need to do so. Weight gain is a highly multifactorial phenomenon that can have many causes. The most obvious cause, of course, is excessive caloric intake, which can easily happen in a society that encourages consumption of sugar-laden sodas, increased snacking, large portion sizes, consumption of processed and fast food, and eating out as opposed to home cooking. Another obvious contributing factor is reduced physical activity (i.e., exercise) in contemporary society when compared with a generation ago. Sedentary lifestyl es, brought about by increased media and computer use, automobile-oriented communities, limited access to safe, convenient recreational facilities, and the demands of school and work, mean that fewer calories are burned. Hidden Causes of Weight Gain…. Weight gain and obesity are not always so simple, though. 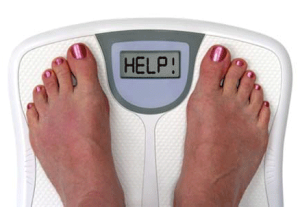 Hormonal imbalances can also contribute to excess poundage. Estrogen dominance, such as occurs in women with fibroids and endometriosis, leads to higher numbers of fat cells and heavier hips and thighs. Women with polycystic ovaries tend toward both testosterone and estrogen dominance and likewise gain weight easily. People who are diabetic or insulin resistant sometimes gain weight even when they eat small amounts of food. Individuals with low thyroid function tend to put on a few pounds more than they should. And, let us not forget chronic stress, which depletes the adrenals and promotes weight gain around the middle. Emotional eating—from a variety of causes too numerous to describe here—puts on the pounds and keeps them on. Food addictions (and addictive tendencies in general), dissatisfaction with personal relationships or work, a history of physical or sexual abuse, anxiety, and boredom conspire to keep some people heavy. Let’s not forget food allergies and intolerances. Many individuals have poor tolerance for common foods such as dairy, wheat, soy, and tree nuts, and as a general rule, whatever the body cannot break down becomes a toxin. Unfortunately, a great many people with food intolerances are not even aware of their state and continue to suffer without knowing why. Environmental issues, often overlooked, might also play a role in weight gain. Pesticides in non-organic, commercially grown food have demonstrated estrogenic effects in animal studies and could thus lead to estrogen dominance in humans. The same goes for hormone-laden meats from animals raised in factory farm-like settings. Eating without awareness can greatly affect our health! Whatever the cause of weight gain, most people feel uncomfortable with it and would dearly love to achieve a healthy weight. A cornerstone of C hinese medicine is that it looks at the whole person, not just the chief complaint. 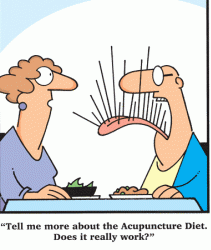 When a patient asks, “Can acupuncture help me lose weight?” the answer is unequivocally “Yes.” It’s a multistep process, however, and it’s not so simple as placing needles in a “magic” point. The first step involves determining the causes of weight gain from the perspective of the organs and meridians (energy pathways). We achieve this through an examination of the tongue, the pulse, and the abdomen, through questioning about lifestyle and eating habits, and by reviewing the evidence of the AcuGraph system regarding the balance of qi in all the meridians. The next step involves treatment. Acupuncture can help re-balance the qi in the meridians so that the digestive and endocrine organs work more efficiently. We also use adjunctive tools, such as moxibustion (application of herbal heat to specific points in a way that nourishes their functions) and especially herbal medicine. Herbs carefully chosen for a specific individual make digestion more efficient, boosts the function of the endocrine and hormonal systems, and makes the human system more resilient in the face of ongoing stress. 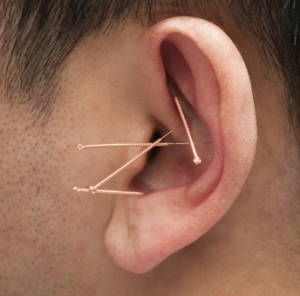 Ear acupuncture is another therapy that helps reduce impulse eating, balance the emotions, and strengthen the digestive organs. Finally, an equally important step to complete the treatment is patient education. Once it becomes clear which factors are contributing to a given person’s weight problem, it’s important to to receive guidance on achieving a healthier style of living and eating. Tired of yo-yo seesaw diets, pounds that creep back on, and not fitting into your clothes? Had enough of social ostracism, feeling sluggish, and wondering why you gain weight when you eat so much less than your friends? There is no magic acupuncture point for weight loss, but there is treatment tailored to your specific metabolic and emotional needs. Find out what’s making you fat—and let a 2000-year-old system of natural medicine help you to a lifestyle that includes a healthy weight.Use the Contact Me page to call or email now or to schedule your appointment!